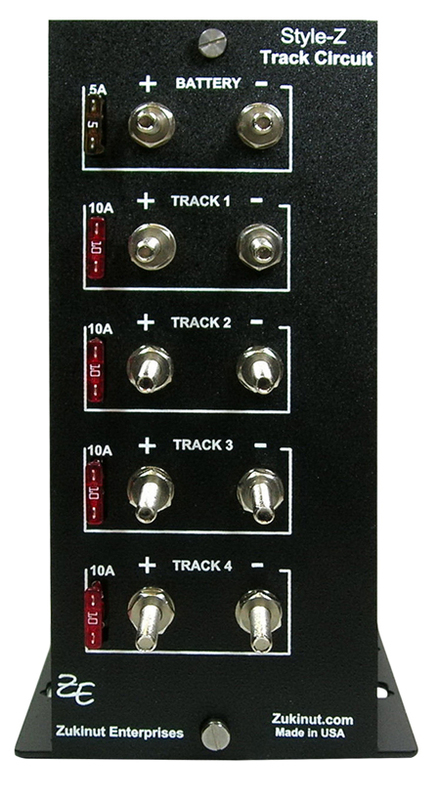 The Style-Z is a 4 output AC/DC track driver designed to be used with a terminating track diode and vital track relay. The Style-Z output signal originates with a crystal controlled 60Hz square wave that is coupled to a push pull power MOS FET amplifier. The amplifier features an isolated power transformer suitable for driving 4 individual track circuits. The final track drive waveform is a capacitively coupled Bi-Polar exponential waveform 6Vpp across 1 ohm. This high drive level aids in track shunting of low traffic, rusty rail applications. This configuration offers substantial improvement in power efficiency over competing units. Additionally, the choice of a 60Hz operating frequency provides improved operation in low ballast or longer track circuits as compared to higher operating frequencies. 4 independent track drive outputs. All track outputs are fused using standard ATO type fuses. 60Hz track drive frequency provides improved operation is low ballast.